The Indian economy has traditionally been dominated by cash, but with increasing internet penetration and rising availability of smartphones, many Indian consumers have shifted to digital payment modes. There are now various ways to make online payments and transfers - credit card, debit card, Net banking, bank transfer modes, e-wallets, and Unified Payments Interface (UPI) BHIM. According to Deepak Chandnani, Managing Director, Worldline South Asia and Middle East and Managing Director MRL Posnet, "There are two parts to this innovation - the frontend and the backend. The frontend is the form factor and the backend is the technology that enables the payments. On the frontend, the avenues for a person to make payments are expanding from cards to mobile phones. On the backend, technology is enabling real-time inter-operable payments, especially on the mobile." Introduction of these digital modes has made transactions convenient for customers, merchants and vendors. 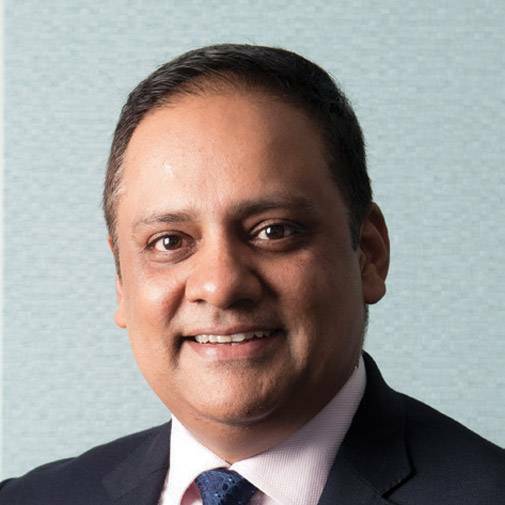 "While cash and digital can co-exist and thrive, digital payments have been growing at a faster clip over the last few years," says Ravi B. Goyal, CMD, AGS Transact Technologies, an online payment systems provider. For wider acceptance, both ends of the system - frontend and backend - have to develop. Apart from cards, Net banking, bank transfer options and e-wallets, a new method of digital payment has emerged and is gaining strength. The government's Bharat Interface for Money (BHIM) mobile app allows for transactions using the UPI. BHIM allows users to send or receive money to or from UPI payment addresses, or to non-UPI based accounts by scanning a QR code with account number and Indian Financial System Code (IFSC) or Mobile Money Identifier (MMID) code. Unlike mobile wallets (such as Paytm, MobiKwik, mPesa, Airtel Money, etc.) that hold money, the BHIM app is only a mechanism of transfer. Transactions on it are instant and can be done 24*7. BHIM allows users to check the current balance in their bank accounts and to choose which account to use for transactions. Users can also have more than one payment address. If the 12-digit Aadhaar number is listed as a payment ID, biometric authentication or a prior registration with the bank or UPI is not needed. Two more payment methods gaining popularity are Near Field Communication (NFC) technology and QR code-based systems. But these require retailers to either upgrade or install new devices to gel with these new technologies. "India has nearly 1 million terminals that support NFC-based contactless card payments. India has rapidly become one of the largest contactless card-accepting markets in Asia. 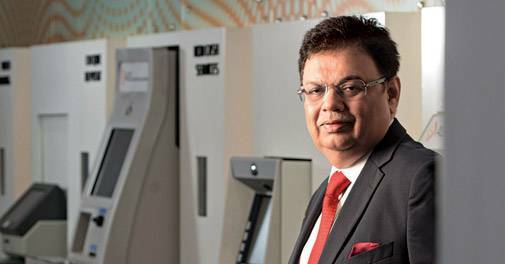 More than a dozen prominent acquiring banks in India have deployed approximately 1 million contactless card-reading devices in everyday acceptance locations across the country," says Shailesh Paul, Vice President and Head of Merchant Sales and Solutions India and South Asia for Visa. However, he does acknowledge that contactless cards are facing challenges in scaling up. While the Reserve Bank of India (RBI) gave its go-ahead for NFC-based contactless card payments in late 2015, there are still only about 20 million cards in circulation. Hence, creating awareness around usage and benefits for consumers and merchants is a major challenge. "With the December 2018 deadline of having recording magnetic strip with EMV cards, and the communication to banks from the finance ministry to start issuing contactless payment cards, it is a good time for consumers to ask their issuing banks for new contactless cards," says Paul. Various digital payment methods are in the fray, but their success will also depend on acceptability among merchants. The convenience has to include not just customers, but the sellers too, and it has to extend to the physical process of getting a Point of Sale (PoS) terminal to reconciliation and payment from the card issuing banks. In this regard, the first and the most visible element is the PoS terminal. An important part of the digital payment systems, this is a computerised replacement for cash register where customers can transact via debit and credit cards. A customer needs to enter their security pin in order to execute a transaction using a PoS terminal. All accounts are settled when the merchant makes the batch settlement at the end of the day and the respective amount, after deducting bank charges, is credited to the merchant's account. 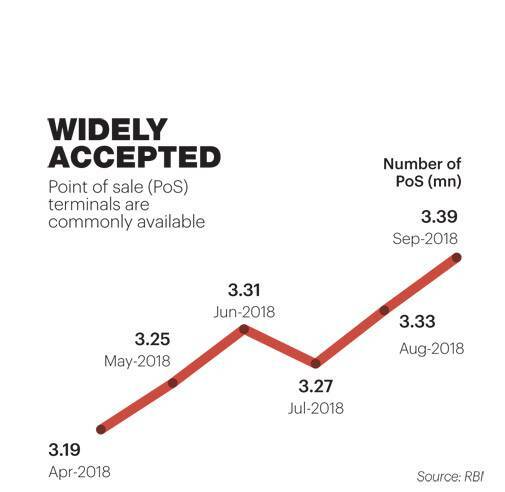 PoS terminal companies earn revenues via three channels - initial device set up fees, Merchant Discount Rate (MDR) and per month rental income (usually Rs 100-350 for mPoS devices and Rs 400-750 for traditional PoS devices). MDR paid by the merchant is divided among the card issuer bank, the acquirer (the one who installs the PoS) and the switch network. The issuer bank gets the maximum share of MDR. 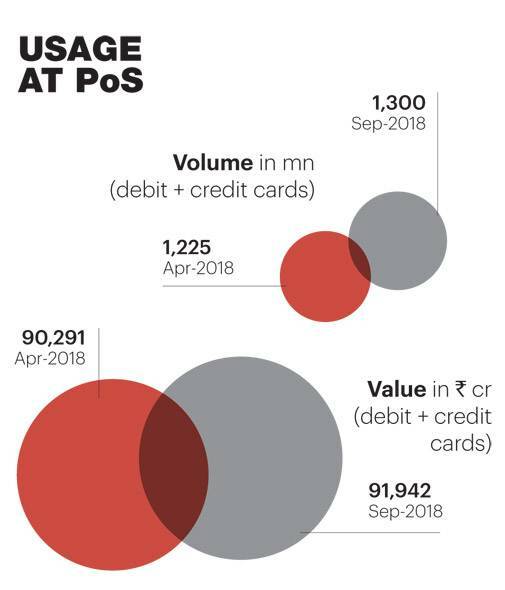 India's PoS terminal market is growing fast thanks to an increasing penetration of credit and debit cards, coupled with rising e-commerce growth in India. Acquiring touchpoints, especially PoS terminals, have gone from 1.48 million in September 2016 to 3.31 million by June 2018. "Both e-commerce (or online) and physical merchants (offline) are showing an encouraging growth. There are close to 4 million acceptance points for card payments in India now including PoS terminals, e-commerce merchants and Bharat QR scan and pay locations," says Paul of Visa. Additionally, changing customer preferences towards high volume of cashless transactions has been driving the demand for PoS terminal devices in India. Retail merchants are making attempts to enhance customer experience by offering flexible payment solutions with advanced payment options at the PoS terminal. The increasing use of smartphones and tablets in India is further expected to drive up the demand for mPoS solutions, especially in the retail sector. "While merchants who were already accepting digital payments have been keen to accept newer modes of acceptance, the encouraging trend is that merchants who have hitherto been in the 100 per cent cash ecosystem are eagerly dipping their feet in the digital payments world," says Chandnani. Merchants who want to start accepting e-commerce transactions have to have their website or mobile app connected to a payment gateway. The payment gateway enables customers to enter their payment details and pay for goods or services using credit or debit cards, bank account, UPI, wallets, among others. Like a PoS terminal, this payment gateway is connected to a financial switch, which sends the transactions to card issuers or banks or other networks to authenticate the transaction. "One of the crucial pillars that will decide the success or failure of digital payments drive is investments in the acceptance infrastructure," says Paul. The infrastructure needed at the retail level could be in the form of a QR on a mobile phone app or a physical decal or a PoS terminal. In the case of a PoS terminal, a stable landline connection or a stable GPRS connection is needed. Despite the rapid pace of innovation in solutions, the growth in acceptance at the merchant level has been modest over the past few years. Rajeev Agarwal, CEO at Innoviti Payment Solutions, says, "Penetration of digital payments is as high as 60 per cent in the top 60 cities. But, this number starts dropping after the top 200 cities. In cities with a population of 400,000-500,000, the penetration drops down to 10-15 per cent. Even in metros, the penetration is fragmented and drops to 30-35 per cent at the fringe of the metros." Agarwal lists out a few factors that impact the adoption of digital payments in the country. These include anxiety among many merchants as well as consumers as digital is not tangible and hence is unable to offer the same comfort as cash. There is also little obvious benefit for merchants operating outside of the metros - local merchants operating in particular catchment areas might not see any additional benefits of using digital modes of payment if it is unlikely to have a significant impact on their sales. On the infrastructure side, innovations have to include seamless and efficient services and support. For merchants the switchover will pick up momentum only when customers start demanding acceptance of digital payments. "Smart PoS that can accept all channels of payment will find favour with merchants. 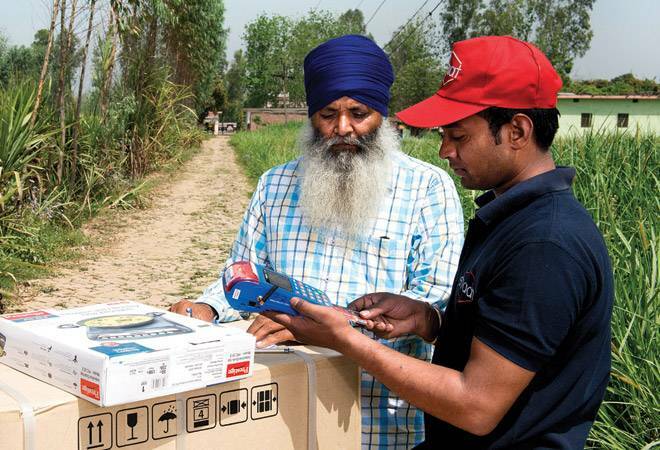 Additionally, merchants are also looking for infrastructure that can help in reconciliation, settlement and dispute resolution," says Goyal. Once the merchant joins in, there should be efficient infrastructure providing support when the merchant is ordering a machine, and the on-boarding and installation has to be simple. According to Goyal, backend technology, especially related to fraud management, is as important as frontend technology and should be enhanced. Innovations in acceptance ecosystem are needed for digital payments to graduate to the next level. "Pricing Transparency Is What We Want"